So your resume worked for you & now you've got a job interview call. Before going for the job interview, must read the following job interview etiquette because this is really important to crack a job interview successfully. How you dress, what are you carrying to the interview venue & how do you greet & communicate really matter when it comes to an interview. Below we're posting some job interview etiquette which surely help you leave a good impression on interviewer & will help you to walk a step ahead in the selection process. 1. Before going for the interview must research about the company. Go to company official website & read the "about us" section. You must read about what they are doing & what are there future plans. 2. Review your resume & do the necessary changes. Try to make your resume short & to the point. 3. Your dressing styles speaks about your personality. while going for an interview must carry formal wear although it differ according to the nature of the job. If you're a female wear very lite & natural makeup & avoid heavy accessories. 4. Must arrive before the time. No body like latecomers, specially in corporate world. Try to reach the venue at least 10 minutes before the time. 6. Must carry at least 2 copy of your resume, one new pen & dairy. You can carry your laptop or tablet but never carry any edibles like soda bottle, water bottle etc. 7. Don't forget to put your phone on silent or make it switched off before you go to interview room. 1. Be nice to everyone & pay attention to everyone sitting in the interview room. Put a smile on your face & listen calmly. 2. Do a firm handshake with the interviewer. It seems ludicrous to be judged negatively by a limp handshake, but people do it all the time. 3. Body language is an extremely important aspect of proper interview etiquette. To win the trust of people sitting in interview room, must maintain an eye contact with them. Never look here and there when someone is asking you a question or you're answering to a question. 4. Ask for the feedback and some questions like when the final decision is going to be made once interviewer done with the question answer round or ask you to ask something. 5. Don't talk too much during the interview & be polite and energetic. 6. 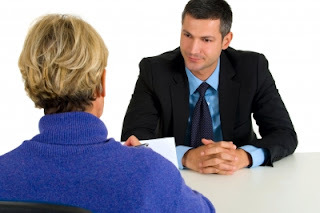 Do not ask about money during your first round of interview. 7. At the end of the interview, when you will invariably thank your interviewer, make sure to thank them both for their time as well as for your own opportunity. 1. Once you come back from the interview, write a thank you mail to the interviewer. 2. Follow them up if you didn't hear anything from them. 3. Don't write anything good or bad about the interview on your online social networks e.g Facebook, Google Plus, Twitter. These are some Job Interview Etiquette the we advice our blog readers to follow. We keep posting about career related articles time to time. If you want to know something feel free to contact us using our contact us form.